So finally I get around to my St. John vacation recap. Better late than never, no?? We had a fabulous time, though it is not hard to have a wonderful time when you are swimming in crystal clear water off white sandy beaches. Don’t believe me? See below. 1. Vacationing in the Caribbean is not nearly as expensive if you rent a condo. We opted to stay in a small condo community near Cruz Bay. We had a small kitchen that was great for making breakfast and lunch. We hit the grocery store for basics which allowed us to splurge on dinner out most evenings. There were some great restaurants (including this one and this one), but this one was our favorite. 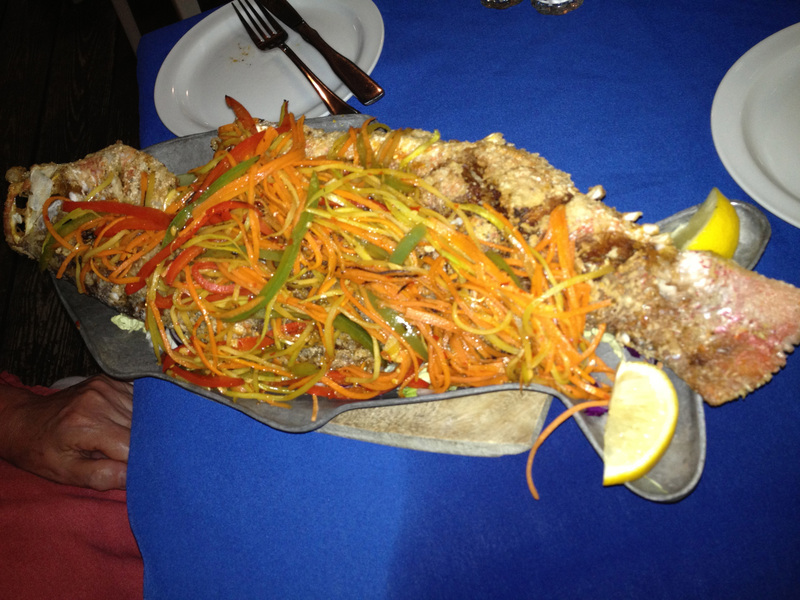 Check out the fried fish plate that we got on our last night. Needless to say, we went to this place twice. 2. Tour guides can show you a whole different island. We were lucky enough to have our cousin, Frank, and his wonderful wife, Mickey, who managed the B&B across from our condo. In addition to helping us find our way around, our fabulous cousins helped us navigate the island, showing us some of its history and some awesome lesser-known beaches along the way. We also got to go to lunch at this little gem of a restaurant, which we never would have found on our own. If you go, I highly recommend the grouper reuben. 3. 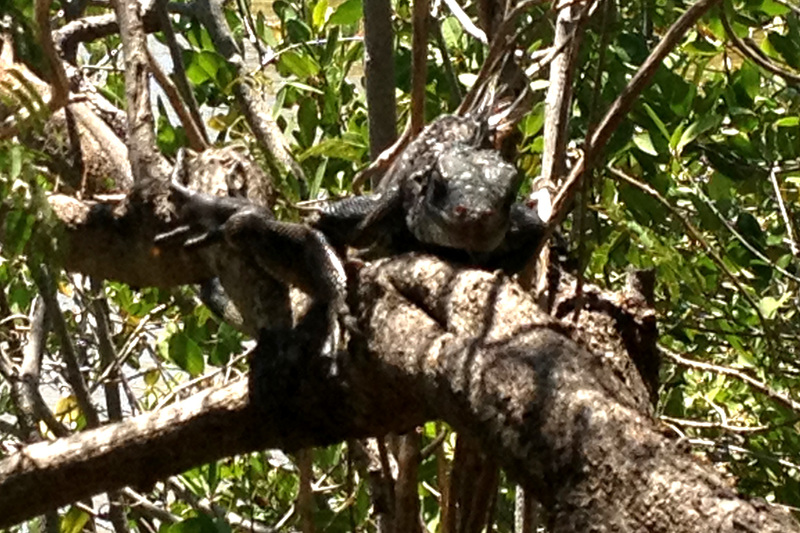 In the Caribbean, goats are domesticated, everyone has a rooster, and iguanas are like island squirrels. Seriously, I have never seen so much farm-life roaming around on paved roads. Goats and chickens were all over the place! It wasn’t a problem for most of the trip until a rooster set up shop outside our place the night before we had to catch the 6am ferry home. Ick. Iguanas were everywhere too. We saw 5 in one tree one night at dinner. 5! This is one that I caught hanging out on the path when were walking into town one night. If you want to see really unique wildlife, you need to look underwater. 4. Snorkeling on your own is overrated, go with someone who knows what they’re doing. I was a disastrous snorkeler, and my mom was no better. We did try, so I guess that’s something. For my part, I floated around for a while, not seeing much, when all of a sudden a HUGE snapping sea turtle crept up on me. It was so scary! (I later found out that sea turtles don’t snap, in fact, they are vegetarians. How was I supposed to know??) In the meantime, mom kept coming up for air, not seeing me, and began worrying that I had drowned. Guess she didn’t have much faith in those swimming lessons she got me! We returned our equipment after only a day (thankfully it was only $8/day to rent), and tried snorkeling Discountess-style the next day. Basically, we stood really still in the water and looked down for long periods of time. Despite looking like buffoons, we did manage to see an octopus, (snapping) sea turtles, silver fish, sea urchins and more! If I try it again, I want to go with someone who knows what to look for (and what will bite you). I think I’d have more fun that way. 5. Don’t even THINK about renting a moped. When heading to a Caribbean vacation, people often dream of renting a moped and scooting around the island each day. Well, not in St. John. In addition to the fact that you’re driving on the wrong side of the road, the entire island is covered in mountains. Really, really steep mountains. So steep in fact that I spent most of the time in the car with my eyes closed, softly singing to myself. You think I’m crazy, but you try speeding up a switch back with lunatic drivers whizzing past you on the wrong side of the road. I think you’ll change your mind. All in all a fabulous trip. If you’re looking for a Caribbean destination for your next vacation, I highly recommend it! It was the BEST vacation and you captured the fun. I agree. “Group snorkeling” is the way to go and Miss Lucy’s is beyond special! I want to go – you should write for a travel magazine – very 3D description! Snapping sea turtles! I actually do snorkeling tours on St John and I found your snorkeling adventure entertaining. I have to agree with you, snorkeling is better with a guide. Of course I’m a little biased since it’s my job. 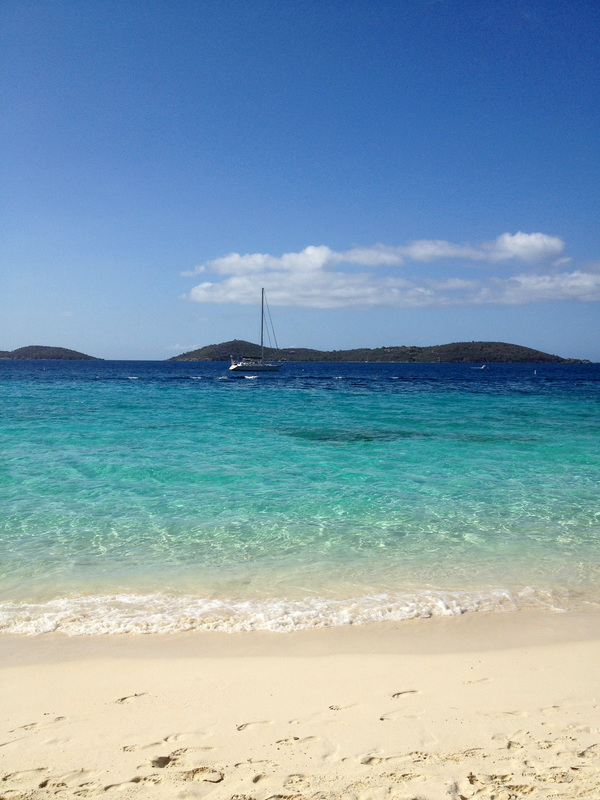 I’m taking a trip to St. John this July with my three best friends… Looks like you had an amazing time! What are some top places/activities that we HAVE to do? Snorkeling is definitely on the list! We are staying in Coral Bay. You should definitely go to Caneel Bay and have a drink on their roof deck at sunset. It’s gorgeous! If you want to get out to exercise, there are a few hikes you can take to more secluded beaches. There are some options here: http://www.seestjohn.com/trails.html. And, if you can stomach the drive, head to Miss Lucy’s for a grouper reuben and a beer one afternoon. Have so much fun!